The latest and perhaps greatest Colt story yet! Releasing 3/17/15! Want to watch a really awesome trailer produced by Justin Wasson to whet your appetite? Look no further! 1. Who is Colt Coltrane? 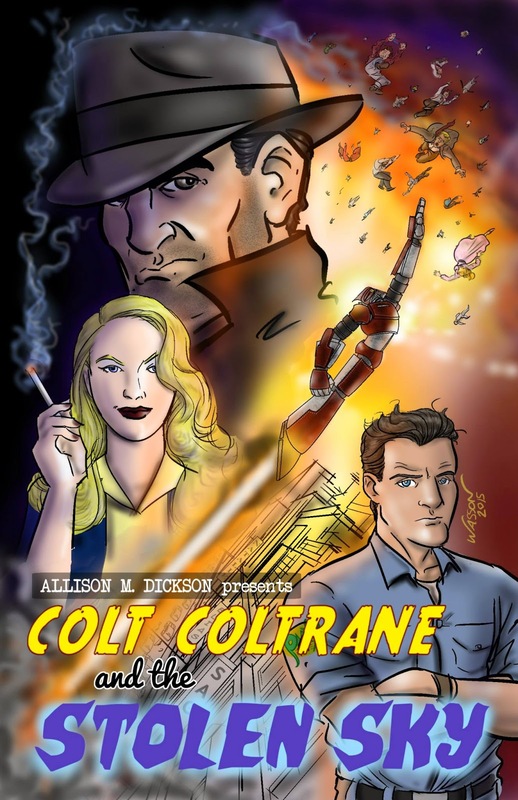 Hugh “Colt” Coltrane is a former Los Angeles homicide detective turned P.I. His specialties are usually tracking down cheating husbands and deadbeats late on their alimony payments, but he also has occasional run-ins with mob figures who remember him from his policing days. Those cases have started to take a backseat of late, though, because he’s been encountering other very strange events in the city, and they’re starting to hit very close to home. 2. What about this robot I keep seeing? What’s he all about? 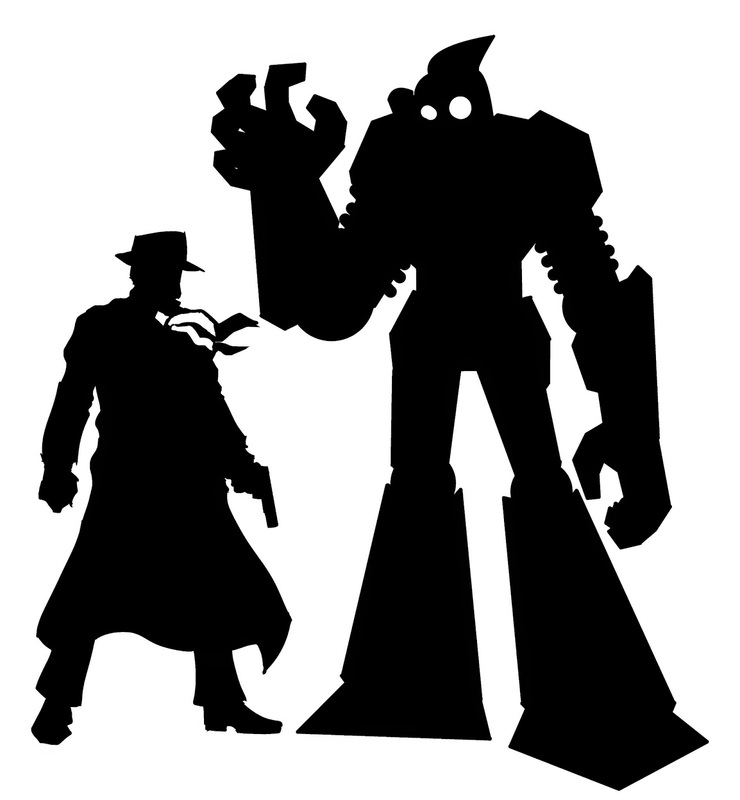 Ah yes, that’s Petey, Colt’s mechanical sidekick. He goes everywhere with Colt. With various modes at his disposal, he can do everything from stealthy tracking and recording, photographing of scenes, on-foot pursuit, and origami. Yes, that’s right. Origami. He also has some other very special capabilities, but you’ll have to read the stories to find out. 3. Wait, isn’t this story taking place in the 1940s? Indeed. The first book, Colt Coltrane and the Lotus Killer, takes place in late 1947. The latest book is in 1949. Gradually, we’ll be moving into the 1950s. These aren’t your typical hard-boiled mysteries, though. 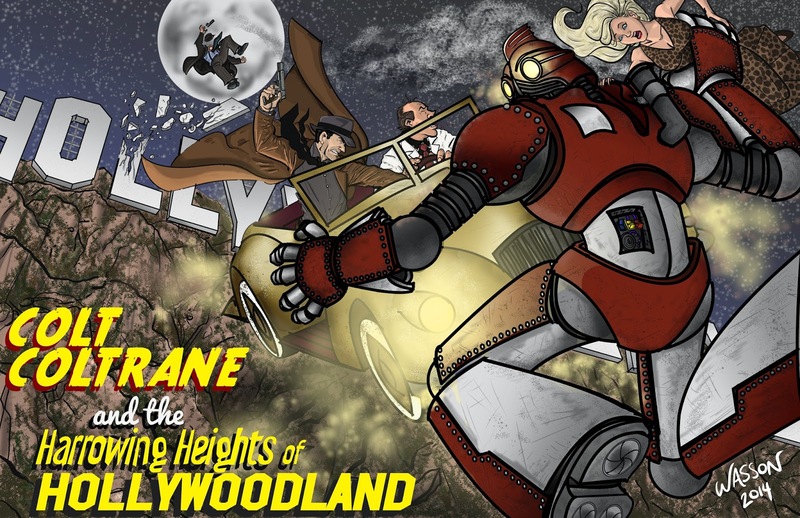 Imagine Raymond Chandler meets Isaac Asimov meets Indiana Jones. Without going into all the details, the LAPD uses their own brand of bots called Patented Electric Tactical Enforcers (P.E.T.E. ), which is not-so-incidentally what Petey’s name comes from. But there are bots all over Los Angeles. Private enterprise has taken over, and there are a lot of folks building them from scratch and scrap. The Colt stories share most of the sensibilities and the aesthetics of the 1940s as we know it, but with that technological twist thrown in. 4. This stuff seems a little different from your other work. Don’t you normally write scary stuff? My focus is indeed contemporary suspense and horror, and the Colt series is definitely a change of pace, but I think you’ll find my signatures all through it. Colt is a gritty dude with a lot of baggage, and he deals with some pretty heavy stuff. And those who know my full body of work also know I dabble in science fiction from time to time. Still, though, Colt has a starkly different tone from my other works. It’s more of a period piece. I typically write stories that take place in the present day, and I would say there is a clearer underlying optimism in these stories that you have to dig a bit deeper to find in my other stuff. However, Colt exists purely as a passion project for me. It keeps me busy between larger, traditionally published projects. I could have pitched Colt to my agent or other publishers (and who knows? I still might someday…), but in this dynamic publishing landscape where being hybrid rules, I wanted something that belonged strictly to me, and would have little danger of competing with other work of mine a publisher would have. Colt is my playground. With him, I can do what I want, when I want. I can experiment and also use it to explore more areas of the publishing side of things. 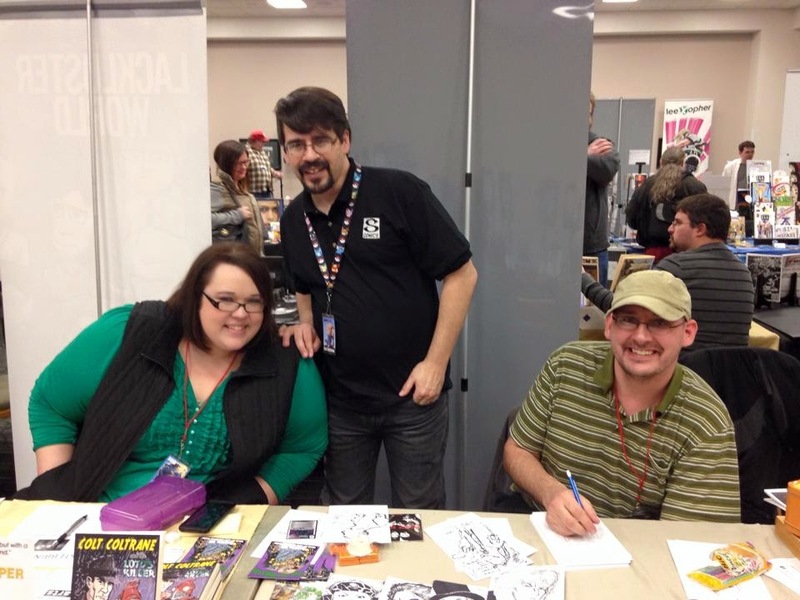 He also gets me into all the comic cons, which have become a thriving and fun part of my career! 5. Who’s that other handsome fella on the Stolen Sky cover? That’s Clutch McIntyre, club entrepreneur/genius bot mechanic. Think of him as a greasier, not quite as wealthy version of Tony Stark. He was once an informant of Colt’s back in the LAPD days, but now the two are close friends. When Colt left the force, he commissioned Clutch to build him his very own bot. Clutch also runs The Parts Bin, which is the city’s exclusive bot-run night club and casino. Bots serve the drinks, take the orders, deal the cards, etc. Clutch has basically taken his mechanical know-how and used it to build himself a small robot empire. He also still has access to a lot of inside channels with various criminal and underground networks. 6. How many stories are in the Colt series so far? Three total, but soon to be four. Colt Coltrane and the Lotus Killer and Colt Coltrane and the Stolen Sky are the longer works. My plan is to have 5 novels with several short stories woven in between, but who knows, it could carry on longer. 7. Do I have to read them all in order? A lot of people have started with the short story and then jumped into the novels. I think that’s fine, because the short stories aren’t quite as anchored in a timeline and are meant to serve as random adventures for the gang, past, present, and possibly future. But if you’re going to read the novels, I do recommend starting with Lotus Killer. While you wouldn’t be lost in Stolen Sky without having read the first book, I think you’d understand Colt’s arc a lot more, and the later book does reference the earlier works. 8. I am seriously loving all this artwork. Who does it for you? Does he take commissions? My artist is Justin Wasson, a dear friend of mine in addition to being a wicked awesome illustrator. He also did the trailer illustrations for my book THE LAST SUPPER. He does indeed take commissions. The best place to find him is on Facebook at his art page. 9. This series would make an awesome comic book or movie. Do you have any plans for that? Justin and I have talked a good bit about graphic adaptations for the existing line of books. It’s just a matter of working out the logistics, finding the time, etc. 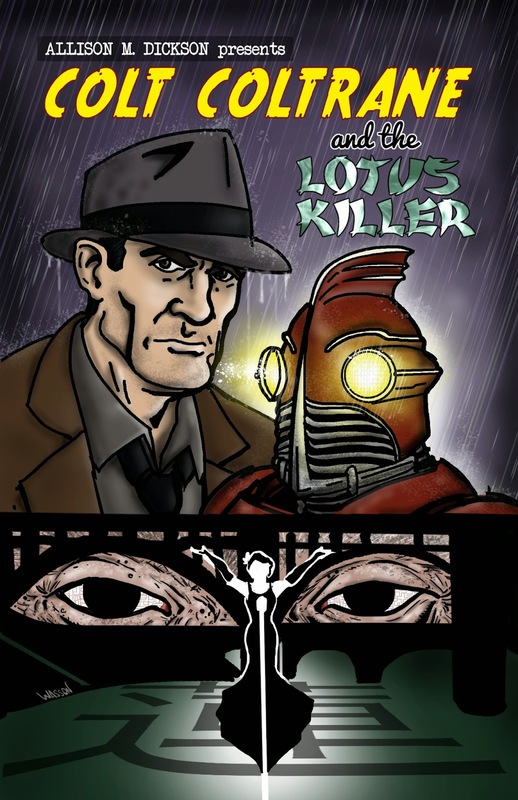 I plan to pen a screenplay for Lotus Killer later this year. 10. I’m sold! I want to buy all the books! Where can I get them? For right now, Lotus Killer is available exclusively on Amazon for Kindle, but you can get it on paperback at Amazon and Barnes & Noble. Stolen Sky will also be available at all of those above mentioned outlets. It’s also currently up for preorder until its release on March 17th, at which point the price goes up, so take advantage of the $.99 price now!